Inside my purse there exists another dimension, one defying the logic of physics, space and time – similar to the one that devours socks in the dryer. 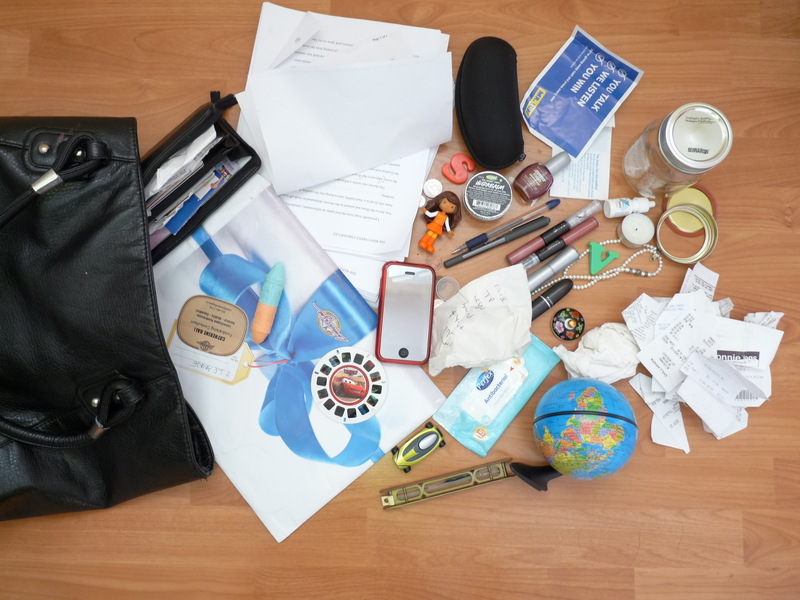 No matter how sparse its contents are in the morning, by mid-afternoon my bag suddenly looks like something from that hoarders show on A&E. Today was a pretty typical example: leave the house in a manic rush to get the kids to school; come home and deal with the wreckage left behind; realize there’s nothing for dinner; spend ten minutes at the supermarket check-out burrowing through my purse looking for my wallet. I ended up dumping the contents of my bag on the conveyer belt in desperation until I finally spotted my wallet amidst all of the mom-crap. The pre-pubescent cashier stared at me, her gaze a disconcerting fusion of fascination and disgust. I shovelled everything back into my bag, mildly mortified, apologizing profusely to those in line behind me. Then I saw another frazzled-looking mother give me a knowing look. She, too, was sporting a purse that could conceal a howitzer. I know I’m not alone. Now if you’ll excuse me, I need to go organize myself (with a little help from my friend, Mr. Smirnoff). Awesome – let’s get those mason jars going viral! My daughter pointed out to me the other day that not only do I carry too much stuff in my purse, now some of it has migrated to my keychain. There are keys, store discount doohickeys, a little flashlight, the car security keyfob and my wallet. So far. You’re going to herniate a disc if you ever attach that thing to your belt loop! OMG it is like my purse! and my kids are 20 and 26! I won a party game at a baby shower once because I had everything on the 25 item list in my purse including an unidentifiable object. Jeez – you mean it doesn’t go away once they grow up?!?!? This must be a mom thing. My own bag is tightly edited: wallet, BlackBerry, gum, sunglasses, lip balm, pen, notepad. (This might be because I change bags so often it needs to be an efficient process.) But I do remember my mom’s purse being a delightful and bottomless catch-all of various sundries. How sterile my bag seems in comparison! I tend to have 6 lip balms or zero lip balms in my purse. Part of my all or nothing approach. Did you ever watch the cheesy 1970s game show, Let’s Make a Deal? At the end while the credits rolled, Monte Hall would go into the audience, and choose a woman, the say, “I’ll give you $5 for every safety pin you have.” Then he’d move to someone else, “I’ll give you 10 if you have an elastic.” I’m not sure he got to Mason Jar, but you would have have broken the bank. You’ll notice I can’t spell “Schmirnoff.” I’m not sure if that’s good news or sad. I am, after all, an English teacher..
Let’s Make a Deal has been revived with Wayne Brady as the host. I’d prefer to watch reruns though. Wayne Brady is not my cup of tea. I keep thinking there’s something to the combination of the mason jar, the tealight and the viewfinder card… hmm… what would Martha do? Lori – I am dying laughing! I sat down to read this after dumping my purse on the kitchen counter a few minutes ago! I thought I had a dentist appointment but couldn’t find the reminder card… Yesterday, my neighbor was standing in my living room, her phone rang in her purse, when she pulled it out, it was HER HOUSE PHONE! She had absent-mindedly throw in it! I will put a mason jar in my purse immediately! That is AWESOME! I took my home phone to my kid’s school last month. Maybe it was all that aspartame we consumed in the 70’s? This is absolutely hilarious. I love the itemized list. Incidentally, I also carry around my checkbook like its 1985. Just wait until your kid is in school – I’m writing checks to them every week! I also tote around a daily planner…like it’s 1985. Because the appt reminders, blackberry and iphone, all synched with my outlook calendar, etc. evidently just don’t cut it. And last week, I couldn’t find a pen while at my desk in the office. I had FIVE in my purse. Mother has a bag which weighs more than she does. It’s true. She has to borrow a wheelbarrow from Farmer Brown any time she wants to go anywhere. Obviously, Mother doesn’t get out much. However, the bag is big enough to carry the nest and all the chicks if necessary. Maybe she should just borrow the wheelbarrow and leave the bag at home. Ha! I need to start a comment of the month club because you just won it, lady! You betcha, toots – they are da bomb!